These are basic notes about model colours and a short section on tactical and branch markings to complement Steven Zaloga's Blitzkrieg which is both incomplete and mistaken in some respects since it relies on rather old material. The main pre-war colour for French vehicles was a rather dark vert olive mat (matt olive green) also designated vert olive réglementaire (regulation olive green), vert olive armée (Army olive green) and vert armée (Army green) although AFVs were camouflaged. In wartime, camouflage was extended to all vehicles, although the actual camouflage patterns were manufacturer-specific or left to the unit's imagination if they were already in service or requisitioned civilian vehicles. Wartime camouflage colours were vert olive mat (in a lighter shade than the pre-war version), brun (brown, sometimes a very reddish hue), ocre jaune (very light brown, ranging from sand to mustard brown) and vert (a rather light green). Actual hues are not known with any degree of precision since no official document describing them in detail has yet been unearthed. 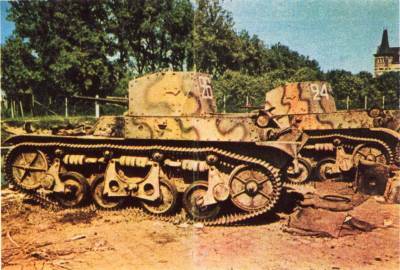 There are very few wartime colour pictures of French vehicles and those that exist are rather poor. Above is one such picture, published in a German propaganda magazine, showing a couple of Renault AMR 1935 in the vicinity of Dunkirk. Although the film has marked reddish overtones which distort the colours, it is a good illustration of the pattern worn by the AMRs. These are suggested Humbrol matching paints for the French camouflage colours found in various modelling magazines. Experiment and pick the one you prefer. Note that apart from requisitioned civilian vehicles, vehicles were factory camouflaged and as the result not only did each manufacturer have its own pattern(s) but the paints used could be slightly different. In his otherwise excellent book Blitzkrieg : Armour Camouflage and Markings, 1939-1940 Steven Zaloga makes a mistake regarding tank tactical markings (the playing cards symbols seen on French tanks since the First World War). He describes the WW1 system and then notes "due to the differences in organization between 1918 and 1940, the first World War symbols were seldom used in their complete form" on WW2 tanks, which is not surprising since it was changed in November 1939 for modern tanks (First World War vintage Renault FT 17 light tanks still carried a variant of the old markings). The new system used aces to identify the platoons or troops in the bridge playing order (Spade, Heart, Diamond and Club) and the order of the national colours (Blue, White and Red) to identify companies or squadrons (see example on the right). The company or squadron commander's vehicle was identified by displaying all four aces in the company or squadron colour. These markings usually appeared on tank turret sides and were sometimes repeated on the rear hull. When carried by Panhard 178 AMDs, they were usually displayed on the hull sides. Smaller markings of this type were sometimes used on other vehicles besides tanks and armoured cars such as the sides of Dragons Portés 6x6 trucks or the 5e BCP's Lorraine APCs and very rarely on artillery pieces. The size and precise location of these markings (and the decision whether to use them or not) were very much left up to the unit commander. The white borders shown on the examples to the right were not universal, although very common. The coloured aces system was sometimes combined with the older company designation system of white geometrical shapes (Circle, Square and Triangle for the 1st, 2nd and 3rd companies respectively). This combination, often using hollow geometrical shapes or using the geometrical shapes and aces in separate locations, seems to have been more common on the Char B1 bis than on the other tanks. Large turret numbers were often found on cavalry tanks with several variations of the actual numbering system. Numbers could be continuous within the battalion, such as in the case of the DLMs where the regiments were identified by their use of the numbers up to 49 in the first battalion and above for the second, continuous within the squadron (e.g. 1-20 or 1-12) or by platoon (e.g. 1-5, 10-14, 20-24, etc.). Another common marking found on French tanks was a single letter identifying the platoon. The actual letter, its size and style were left up to the platoon commander who usually used the first letter of his last name. This system seems to have been much more common on B1 bis infantry tanks than on other vehicles. Instead of these three types of tactical markings, units sometimes used a system of their own such as the 17e Bataillon de Chasseurs Portés (BCP - Motorised Chasseurs Battalion). The mechanised infantry battalion of the 2e Division Cuirassée de Réserve (DCR - Reserve Armoured Division) used a unique "domino tile" marking on the side of its Lorraine 38 L APCs' superstructure to indicate the vehicle's company and platoon. However, I do not know which half of the tile identified the squadron and which one the platoon. Photos of some of this unit's Lorraines show an alternative system of large letters on the hull sides though. Another unique set of markings was used by the 2e DLM's 71e Régiment d'Artillerie to identify its 75mm batteries. The system, illustrated on the right, used coloured stars to identify each of the groupes (battalions) with a letter.number combination to identify each of the batteries. These markings were worn on the front doors of its Laffly S 15 T tractors. A variant of this system seems to have been used by the 3e DLM's 76e Régiment d'Artillerie on its tractors. In this case however, the individual batteries were identified by a coloured disc in the centre of the stars, these discs following the same colour order, black, brown and yellow, as the battalion stars. In both cases, these tactical markings were combined with the artillery and towing symbols (see Other Markings below), both worn on the front left side of the cab. Although relatively frequent on Cavalry armoured vehicles which operated far to the front of friendly forces, the practice of painting national roundels doesn't seem to have been the subject of any regulation. The usual locations were turret tops (often on the commander's cupola) to serve as air recognition markings and turret rear. A very narrow white outer ring was sometimes added to the roundel but this practice was not very widespread. The actual number, size (between 30 and 50 cm) and location of national roundels depended very much on the size of the vehicle and the unit's amount of experience with friendly fire. According to the high number of such incidents, including between friendly armour, vehicle recognition does not seem to have received much emphasis during training ! Some particularly unlucky units soon sported these roundels on hull front and sides as well as turret rear and top. Besides the tactical markings, the most common markings were those indicating the branch of the armed forces the vehicle belonged to. These markings are totally ignored by Steven Zaloga's Blitzkrieg apart from one caption where the cavalry symbol on an AMR 33 is mistakenly described as a possible 2e DLM divisional marking (which admittedly did use a blue diamond with a croix de Lorraine as its symbol). An order issued on 11 January 1940, made it compulsory for all unarmoured vehicles to display a 20 cm white square bearing a coloured geometric shape indicating which service it belonged to. The shapes and colours were as follows : Infantry 10 by 15 cm yellow rectangle, Cavalry 15 by 10 cm blue diamond, Artillery 15 cm red triangle, Engineers 15 by 10 cm brown oval, Supply and Transport (Train) 15 cm green circle and Air Force 15 cm orange six-point star. This symbol was to be worn on the front left side of the vehicle (usually the front left wing or mudguard or the the left side of the cab) and sometime during the Spring it was added to the rear left side also. Motorcycles were to have a smaller version painted on the front mudguard or on the front of the sidecar when one was used. These symbols were almost universally worn by soft vehicles by May 1940. Tanks did not use them although at least some Cavalry AMR and AMD displayed them. Another symbol often displayed was the towing sign, a yellow triangle on a dark blue square panel of roughly the same size as the service markings above (note that the white border on the example to the right is only added to give better contrast against the page background colour). While it is mentioned and correctly identified by a caption in Blitzkrieg, it is shown upside-down in the colour plates. This symbol was to be displayed, facing towards the front, by all vehicles while towing a trailer or a gun and covered or removed when not towing. As a result, this panel was very often seen on Renault UE supply carriers and all artillery tractors. Note that this was not a purely military symbol but merely a requirement of French road regulations. Finally, it was decreed in early 1940 that a reflective surface in the form of a white circle or horizontal rectangle be painted on the back of trucks and lorries for station keeping during night convoys. Below is another colour photograph published in the July 1940 issue of Signal magazine. Again, the hues are rather distorted but this gives a good general idea of the basic colours. - FS numbers are given for the Humbrol paint rather than the actual uniform colour. - Tank crewmen type helmets were also worn by motorcycle troops and anti-aircraft gun crews. Les Engins Blindés Français, 1920-1945 Vol. 1, Pierre TOUZIN, Paris : SERA 1976. Sedan 1940, Service Historique de l'Armée de Terre, Vincennes : SHAT, 1990.